For many of the people coming to Salt Lake Comic Con it was a place to have the opportunity of meeting the media stars they have come to enjoy. For many this means thinking of those who perform on our favorite television programs and movies—and there were a lot. For three full days we had the opportunity of meeting, getting autographs and photographs, and spending a few minutes with those entertain us on the big and little screen. Along with those who are well known there were those getting started. Independent film makers were there sharing their visions. Other forms of art were also well represented. The artist alley was comprised of artists who have worked on major animated productions and books along with those who are just starting out. I think every art form was represented (I’m not going to try to name them all because I know I will miss somebody’s favorite). I talked with some of the artists who were impressed with the attendance of Salt Lake Comic Con. A couple who travel between conventions were really enjoying the level of knowledge and courtesy their fans have in Salt Lake City. This was not just in the form of two-dimensional art work. There were a number of crafters sharing what they create. There were all the accessories you could be looking for to complete an outfit for out on the town, or at the next cosplay event. There were those who had items to show your fandom in more everyday items like pens and blankets. If you were unable to find what you were looking for, you could talk to people and they would help create what you wanted. One shop was laser etching on the spot. There were other fandoms in attendance. Books are strong forms of entertainment and there were some wonderful authors sharing their thoughts and their books. Forewarning: I am biased about books. They are my first love of entertainment (second is games). I talked with authors covering a wide range of genres and they, like the artists, were impressed with the people they were meeting. A number of authors were selling out of their stores and I know a couple who were frantically coming up with extra copies for Saturday because they had sold out on Friday. The gamers were not left out. Both electronic and tabletop games had strong showing, both in providing products and in looking for games. Salt Lake Gaming Convention had a location where people were able to sit and play console games. There were also game shops with items so fans could show which games are their favorites. Tabletop games were also available. Along with the game shops, I know there were a half-a-dozen developers showing their games. There were also accessory companies with dice, bags, and boards. An open gaming room was there with the Adventurer’s League hosting tables and open table space for everyone to use. Some people found this a nice reprieve from the volume of the general floor. I am also happy to say there were organization in attendance who help the community at large. There were cosplay groups and other organizations who were there raising awareness and support for people in need. I am even more happy to report those organizations said they had great support from the people they came in contact with, either at their booth or out and about throughout the convention. 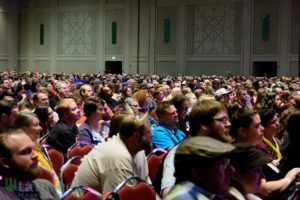 The largest group at Salt Lake Comic Con were the fans, you who are reading this. Throughout the event I heard speakers claim if it wasn’t for the fans, none of this would matter. It’s true. Not in the way that a cynic would claim because of ticket sales, but because it is the energy and enthusiasm of the individual fans coming together that make conventions exciting and fun to be at. There was no point during the entire convention where cosplay was not occurring. There were cosplayers in strollers to those with walkers. There were cosplayers for every area of fandom. I like to think I have a good understanding of the different areas and I met players I didn’t recognize. And, yet, along with those of us not in costume, we were all sharing in the event. I enjoy seeing how people were gracious in their play. People of all shapes, sizes, ages, and abilities were good to each other. We were having fun. We recognized those who had done something we appreciated and we were gracious in being appreciated. Conventions are hard on the body. I know people who are most likely sleeping away this afternoon (I am writing this on the Sunday after) and I am there with them. Others are still cleaning up from the merriment. While others are making their way home, or to their next engagement. Event fans in attendance will most likely take some time to allow themselves to recover from the time spent at the convention center. We attended knowing the physical consequences. This convention is about reviving the spirit of creativity and fun. We went because we were seeing not only the people involved in the creation of the stories or bringing those stories to life, we were seeing the characters they represent. Many were becoming the characters to show our appreciation for what they have given us. We go because it gives us the memories of past stories, and the hope of new ones. It is the people I meet that make conventions so great, and all the people who were part of Salt Lake Comic Con 2017 made this event a wonderful memory. This goes to the organizers, the guests, the attendees, the workers in the booths, the workers of the convention center, and the volunteers. I tip my hat (it was either a cap or bowler depending on which day) to everyone. Now, I think I will take a nap and start getting ready for the next event.